Hi y’all! This could possible be my fave post yet! 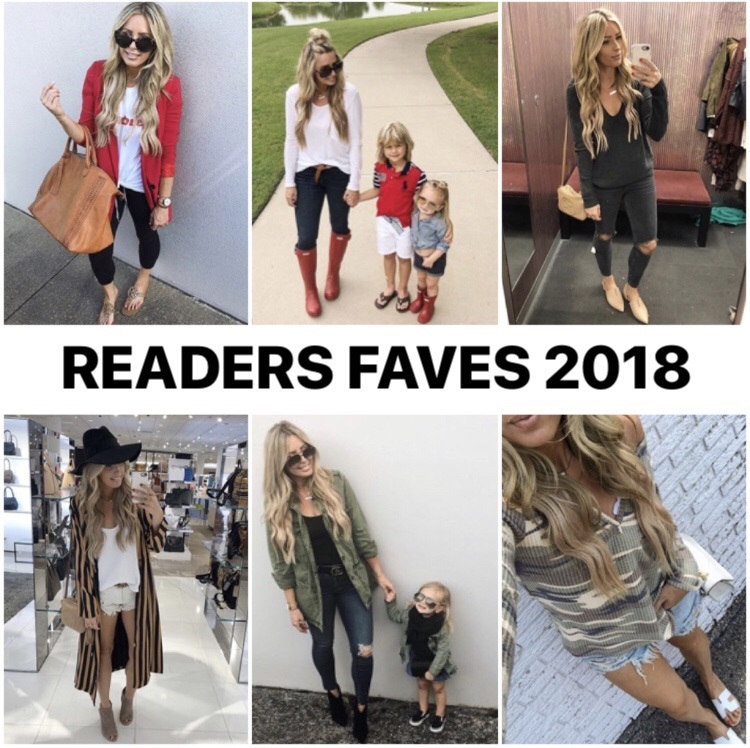 Today I’m sharing YOUR favorite top 15 products from 2018. Stay tuned for the #1 purchased item…I wonder if you will be just as surprised as I was!!! This bralette adds a simple detail to a basic outfit. It comes in multiple colors and is personally one of my favorite purchases that I had to snag it in multiple colors. Similar option HERE & HERE! These jeans clearly speak for themselves. The fit is unmatched & these will last (I’ve had mine for 4 years now…I also hand dry all my jeans). And speaking of the quality, these jeans are SO comfortable and as you have seen throughout 2018, they continue to be on repeat. Similar options is HERE! This sandal is surprisingly comfortable. For spring & summer, these are a perfect staple to run errands and everyday wear. These are similar options HERE & HERE! This Suede Moto Jacket is a staple! What makes this piece so perfect is that you can wear it year round. This is a similar option HERE! 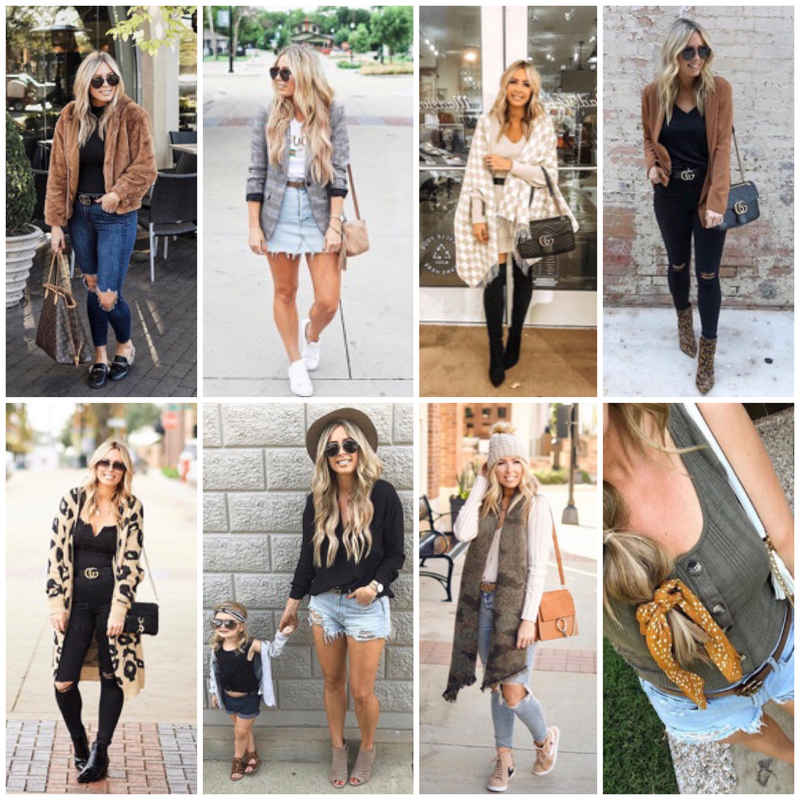 This jacket is a staple and is a piece that can be worn year round. 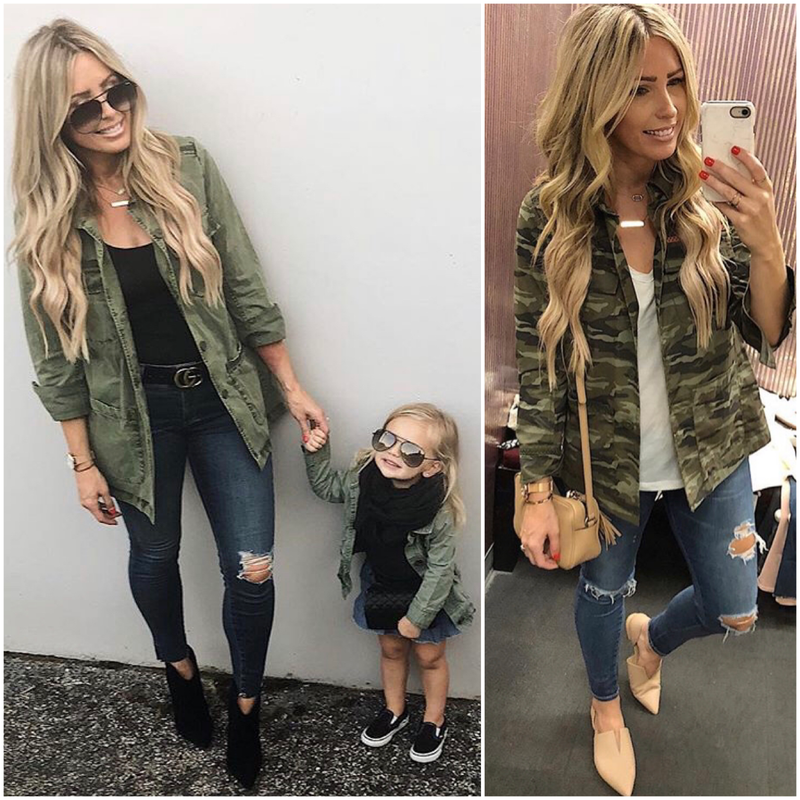 This is the lightweight jacket I’m also sharing from the Nordstrom Sale this utility jacket in the camo option HERE! 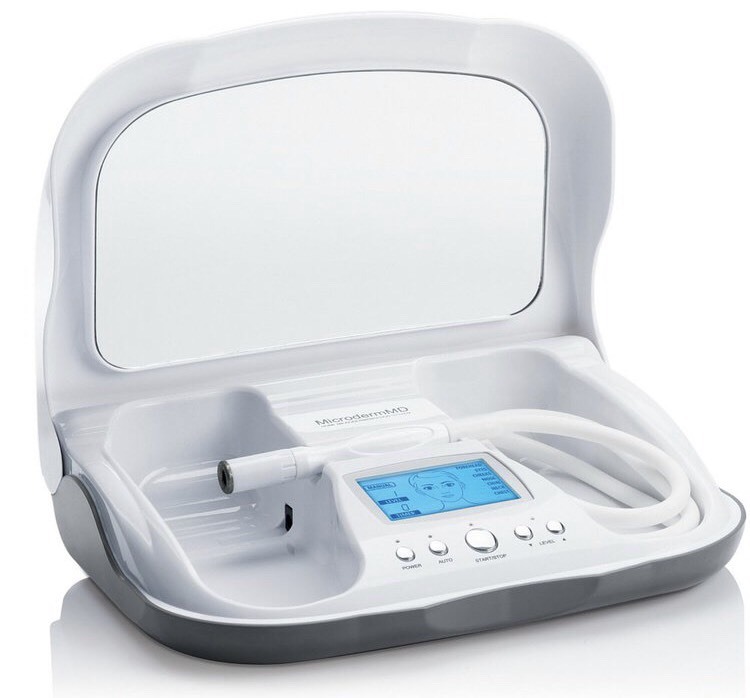 This Microderm MD is the gift that keeps on giving! You only have to use it twice a week and within 90 days will see results. I personally noticed results after my 2nd use from this device. A typical microdermabrasion at a spa is between $75-$150 (so this system basically pays for itself within a week & a half…like I said…the gift that keeps giving!) This system helps reduce large pores, smooth the texture of your skin, helps with fine lines & wrinkles, reduce sunspots, helps with acne and so much more. My experience over the past year and a half, the Microderm MD helped get rid of the acne between my eyes, reduce my large pores by my nose and on my cheeks & smooth out the texture of my skin. Also, this system takes less than 5 minutes and is so user friendly! I’m a mom, so anything that typically takes over 5 minutes makes it a challenge to continue using it on a regular basis, so, luckily this is quick & easy to use. Also, there is an auto button (which I use everytime I do my face) that tells you exactly where to use the diamond tip on your face… it changes the suction for different parts of your face, neck & chest. This hands down has was the best investment I made in myself. I was not surprised when I saw this Gucci Dupe Belt was in the top 10. I would love to real Gucci belt, however, I personally will not spend that on just a belt, but, I would on a handbag. I loved this belt so much, I snagged it in the brown color as well. This piece is the perfect staple to add to your wardrobe to complete any outfit. This is the actual Gucci belt HERE. 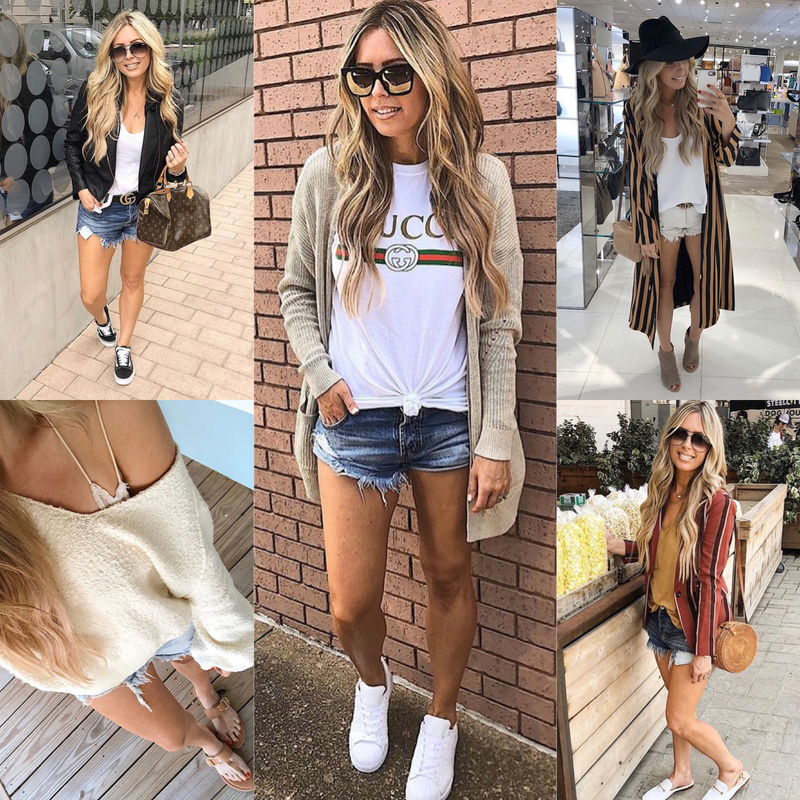 These shorts are SO flattering & can be dressed up or down. These come in multiple colors and will be a spring & summer staple. These nice thing about the shorts is that they can be worn dressed up. These are a few colors options I also have HERE, HERE & HERE! 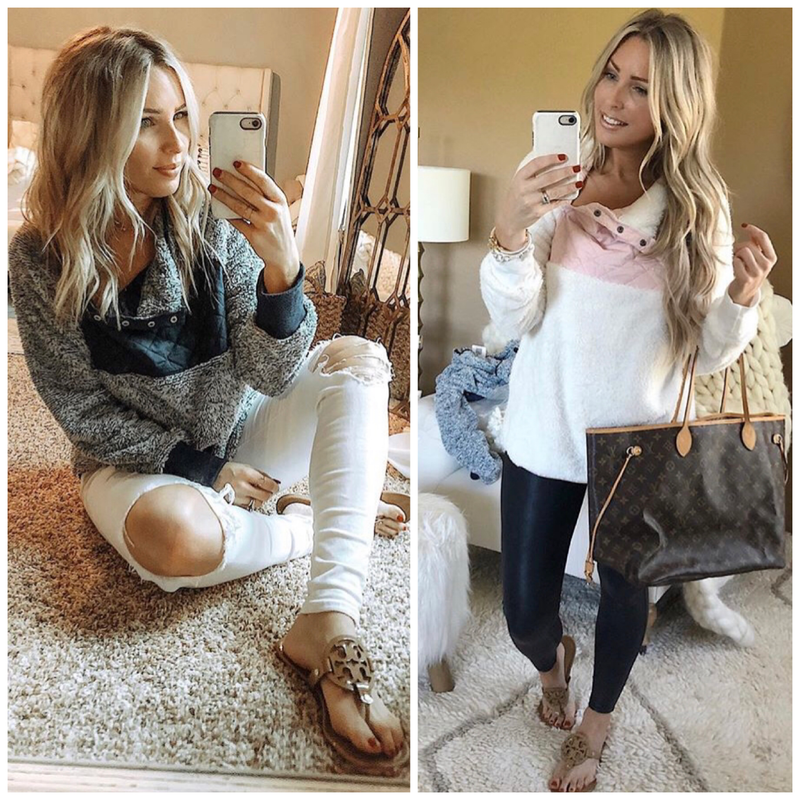 This top is is sold out, but these are similar tops HERE(under $20), HERE ($39.99) & HERE (under $25 & almost identical)! This top is currently sold out, but these are similar tops HERE (on sale right now for $15.60), HERE & HERE! 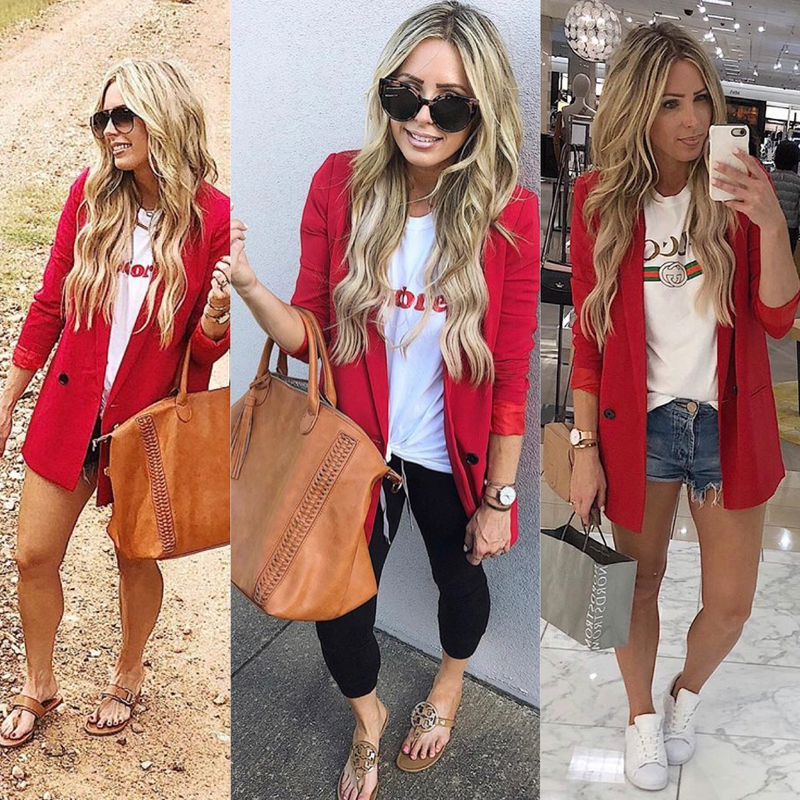 This blazer is currently on sale for under $30! It comes in multiple colors and pull a basic outfit into something a little more interesting. These are similar options HERE ($40) & HERE (under $30)! This flexible tee comes in multiple colors and prints and is perfect for layering. This is a staple you need in your closet. I actually snagged this tee in every color option since it’s currently on sale for under $8. These are similar options to the tee HERE ($10) & HERE! I was not surprised when I saw this pullover in the top 3. This fleece pullover is SO cozy and lined on the inside as well. It is only $26.99 and comes in multiple colors. 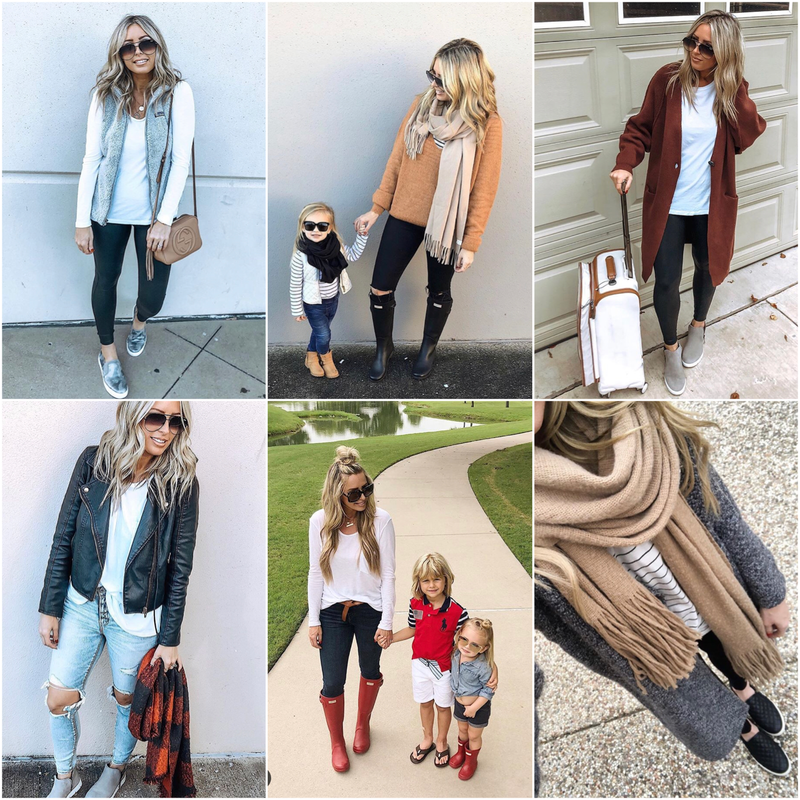 This is 100% a fall & winter staple! There is a reason this long sleeve leopard cardi is #2!!! It is SO good and trendy. This is perfect to layer and even wear with shorts in the spring. This cardi comes in multiple color options too. These are 2 similar options HERE & HERE! 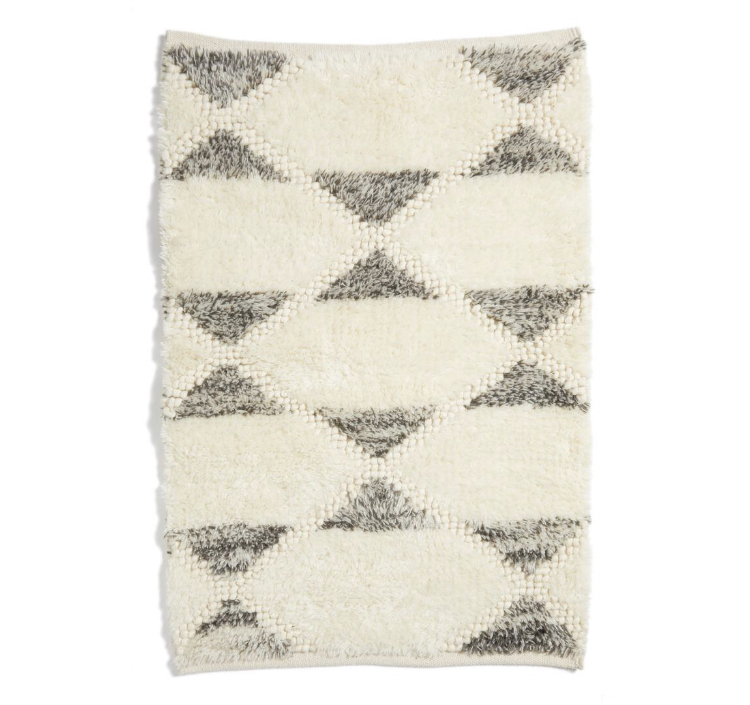 The #1 most purchased item is the dupe rug that is in my blog room. This is the actual rug in my blog room HERE and this is another similar affordable option HERE. The free people bralette is my favorite and I might have purchased it in several colors. LOVE! So happy to hear you love it! It sure is the coziest! Right! Gimme all the camo!